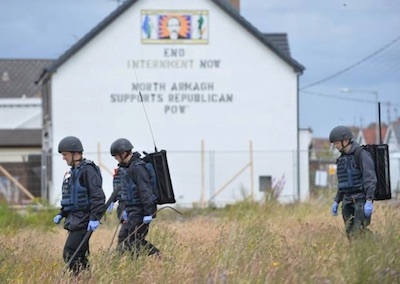 Recent depictions of British Army house raids in Lurgan and Derry put pay to longstanding claims that the political process, ongoing since 1998, has successfully delivered the complete removal of the British Army and its physical apparatus from the Six Counties. 17 years from a political agreement promising full demilitarisation and 10 years from the supposed end to Operation Banner, under which the British Army was deployed in Ireland throughout the Troubles, we can see now the reality of the situation. Britain has not in fact demilitarised but simply returned to levels of troop deployment consistent with her needs during ‘peacetime’. Despite the rhetoric of some within the Nationalist community, who suggest the 1998 Agreement ushered in ‘a new dispensation’ - that concessions on the Nationalist side regards the British sovereign claim carried a quid pro quo relating to matters including British disarmament - recent days have shown that despite the hype and bluster, the only thing ‘new’ in any of this is the support our political representatives now offer the structures of British rule in Ireland, in the guise of Stormont, in the guise of the PSNI and in the guise of the British military’s continued presence in our country. Of themselves the images coming out of Derry and Lurgan, of British Army ‘boots on the ground’, are a worrying development, but they also belie a more casual truth, that this is in reality nothing new and that contrary to popular belief, the British Army has never physically left Ireland. 5,000 British soldiers remain garrisoned in the Six Counties, despite claims of full demilitarisation, and British Military Intelligence, in the form of the ubiquitous MI5, has long been granted primacy and operational control over key areas of policing, despite the myth of a ‘new beginning’. Indeed a recent report from renowned NGO, the Committee on the Administration of Justice, determined that vast swathes of PSNI structures and personnel in some way or other fall under the command of MI5, a clear demonstration of a military presence at the heart of both policing and the wider political process. Given how the Nationalist parties in Stormont agreed to all of the above, their description of the current political reality as a ‘new dispensation’ or a ‘new beginning’ is difficult to fathom. This is the same MI5 who ran collusion, who played a critical role in state-sponsored murders as those of Kathleen O’Hagan, Roseanne Mallon, of Pat Finucane and countless others. This is the same PSNI who collude to this day in obstructing truth and justice regards the role of its predecessor in that same collusion war. This is the same British Army who upheld a decades-long campaign of terror on behalf of the state, who likewise were never held to account for the long litany of criminal acts engaged in throughout the recent conflict. A new dispensation? As we can see from recent events in Lurgan and Derry, the more things change the more they stay the same. If anything, wishful claims regards demilitarisation stand exposed for what they are: a ruse and a lie, whose purpose is to construct a facade of normalisation, to deflect and sweep from view the British sovereign claim. The reality is that Britain’s physical presence in Ireland was never ended, it was simply scaled back to engender perceptions of the North as a normal society, as though partition-rule were now of little consequence in present-day Ireland. Occupation though does not require standing armies on foot patrol, even where these remain in effect. Over the long-term it is more stable and sustainable to have visible signs of occupation removed from plain sight and buried in the political process. Better again if former opponents can be co-opted into that process. With the representatives of Irish Nationalism firmly ensconced in such an arrangement, with their acceptance of PSNI, Military Intelligence and the British Army as worthy institutions within our society, it’s hard not to see it as job well done. With the British content to expand the remit of their ‘regiments-in-residence’ two things are now obvious: they are intent on flexing their military muscle, a political statement that Britain remains fully in charge and a two-fingered salute to those who believed they were serious about change in the North; but perhaps of greater significance, the illusion of normalisation of itself is now coming apart at the seams. How this plays out remains to be seen, but with Stormont in crisis, soldiers on the streets and Westminster intent on claiming victory where none can ever be, then the failing deception that is normalisation may well herald a more systemic crisis in the political process. As such, republicans must position to influence the turn of events. Our thinking must be to shift the narrative away from that which currently serves Britain, setting out a republican analysis and a republican political strategy to advance Irish Unity, rather than one in line with the needs of the occupier and its ongoing excesses, which serves only to hold Unity back.